Home > Mare's Musings > Mucho Macho Man in Retro: Thank You, Pegasus. This is just one of 30,000 letters you’ll receive from admirers–don’t worry, big boy, I don’t expect you to write back. You have fans from all over the world, and I’m just one little person who loves you. But even though your new stall at Adena Springs is probably covered in cards and gifts, still I feel compelled to write to you and tell you how your life and journey have affected my own. You just retired from horse racing, and I wish you well. You turned six in June–you’ve raced for over half your life to-date,and you earned your way into the pantheon of Great Horses. I wept buckets when I read the news, and sporadically through the night every time I read your name. It was as if water was just falling out of my eyes, with no shut-off valve. I had to sit down and pinpoint the reason why I’m so touched by this announcement. Your career has been the subject of many fine factual articles by the best turf writers in the world. Everyone who loves our sport knows the things that you achieved in your racing career. Not all your victories were on a race track, but all your racing victories lit fires in the hearts of your fans. Just a few months ago, you nailed the Awesome Again Stakes, then the Breeders’ Cup Classic. Those were extraordinary races, and thrilling beyond description. Your Breeders’ Cup Classic victory was named the NTRA’s Moment of the Year in January, 2014. Truly, it WAS The Moment of 2014–the moment that gave more goosebvumps and tears to more lovers of this sport than any other. You won the Secretariat Vox Populi Award. You were elected unanimously by fans, voting online; by the Vox Populi committee and by Penny Chenery, herself. Your life and example touched all of these people. You are so loved, but not because you’re a “pretty horse.” “Pretty horses” don’t nestle into the human heart. I call it soul–others may call it guts or tenacity: you are an inspiration to so many humans–humans who sorely need a hero. I am but one of these broken people. Humans, like you, have at least two sides, Macho: the one side–that which is invested in a race horse as strictly a horse who is racing–measures success at the teller’s window. The other side–dare I say, the spiritual side?–measures a horse’s success in chills and tears. In your NTRA Moment of the Year, your fans cashed in, in spades. But I think that my favorite moment in your career was when you stomped on the competition just because you could, and took the Florida Sunshine Millions Classic–your second win of that race. We all cried as you romped toward home, 14 lengths ahead of the field. But again, I had invested something more precious than gold in you that day. So what IS your legacy, Mucho Macho Man? God created you “…fearfully and wonderfully made,” a complex being in your beautiful, physical perfection. But He also allowed a path for you that was difficult and painful at times. It was frightening at many turns, I’m sure –but He hovered and oversaw it because He’d promised to be with you, holding you at every turn. And He knew that you were made of big stuff. Not just big physical stuff–He had graced you with a spirit that absolutely would not give up. Your journey has included many circumstances that would have felled a lesser horse. Surgeries, infections and a quarter crack all tried to derail you. Both your life and your career as a race horse could have been ended by any of these things. But like any true mythological hero–your heart drove you on. If indeed life is a journey and not a destination–your journey, every step of the way, has shown me how to live, victoriously. I’d like to share something with you: My life has been rife with disappointments. I was delighted when I read that Patti and Dean Reeves had become your owners outright. (Really, I think of them as being your parents–their love for you is so genuine, and it was obvious from the first image I saw on TV of the three of you together. I’m sure that you think of them as your parents, too.) I’m certain that your relationship with them–their gifts of love and the freedom to be yourself–contributed tremendously to you growing as both a spirit and as a race horse. My life hasn’t paralleled yours–I’m not a horse. The only surgery I’ve had (so far) is removal of my tonsils when I was three. No near-catastrophic viruses. But as I wrote, all living beings have problems. I have arthritis in every joint in my body, three different varieties. Diagnosed when I was 24. (That’s human years.) I don’t know a day without pain, Macho–and that is precisely why I’m crying tonight. Oh, no, I’m not crying because my fingers hurt as I write this. Not at all! After 30+ years of arthritis, I’m used to it. I’m crying because, every time you raced–my heart raced with you. I cried last night when I read that you’d retired, because it hit me that I’d never again see you race, either on TV or live. I sat here at my desk and wept like a baby because, I’d assumed that someday I’d see you live again. That someday I’d feel the Earth, herself, rumble beneath my feet as you pounded toward the finish line right in front of me. On so many down days, you carried my spirit on your strong back, Macho. Many were the times when I was discouraged about this-that-or-the-other-thing…and then I’d see you race. Your 17hh frame, elegantly wrapped in your perfect muscles, beating up on the dirt beneath your beautiful hooves–carried my soul and my hopes back to life. You breathed joy and power into so many moments of my existence that had been numbed by loneliness, failure or grief. Back to your Florida Sunshine Millions Classic win this year: One of my best friends–Lenny–died on January 7th. We were racetrack buddies. He and his wife became family for me. I can’t count how many races we watched together over the years, live or on TV. When I watched your gorgeous victory in the Florida race (just a few days after Lenny died)– I could hear Lenny screaming with me at the rail. You carried both of us that day, Macho. You helped ease my grief and reunited me at the heavenly rail with a dear friend. I cried that day, too, as I thanked God for allowing Lenny’s memory to cheer you on with me. God took you–a beautiful horse–and He gave you your very own spirit, one that He knew would grow proportionate to your monstrous physical frame. That indomitable spirit–your heart–the depth of your soul–all of it I see in your eyes, Macho. Every time today that I saw a photo of your beautiful face, I cried because your eyes are absolutely, well, heavenly. So often God has reminded me of the gentleness of His creation through your deep, pensive eyes. “The wind of Heaven is that which blows through a horse’s ears.”. God gave you power and strength, Macho. He made you majestic, so that we mere humans might begin to understand–even a little–about His own absolute power, strength and majesty. I was in awe the first time I saw you: I remain in awe tonight. For sharing your generous spirit and encouraging me on my path, I love you. For showing me that, yes, life can be tough–but I can be tougher–I thank you. For sharing your wings of steel with those who need courage, we thank you for being our Pegasus. You have been an angel to me, dear one. Like God’s winged messengers, you brought good tidings of great joy to my weary old heart more times than I can count. Thank you, and God bless you in this new phase of your life, Mucho Macho Man. May your fortitude, self-belief and extraordinary spirit be passed onto all your progeny, in spades. No one has summed up Mucho Macho Man’s career better than this press release, distributed by Adena Springs and Dean and Patti Reeves. Enjoy! 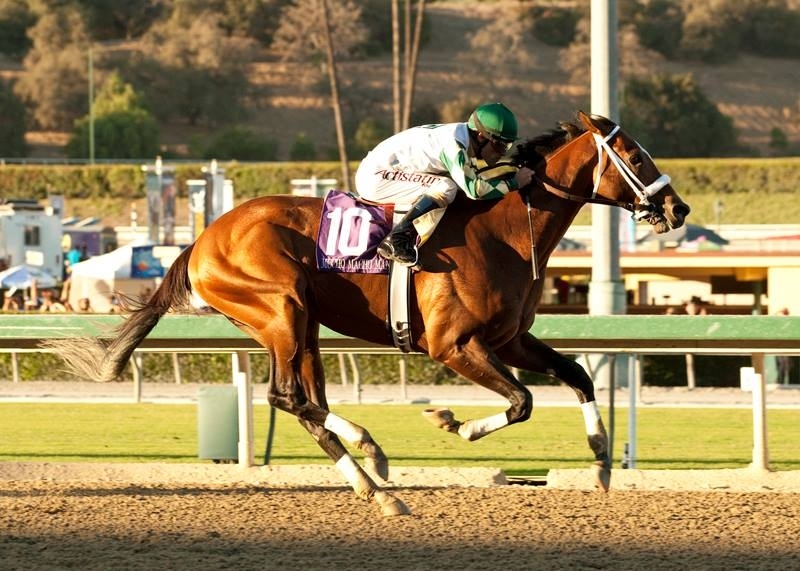 Paris, KY–Reigning Breeders’ Cup Classic Champion Mucho Macho Man has been retired from racing, and will enter stud at Frank Stronach’s Adena Springs Farm in Paris, KY. A fee for the 6-year-old earner of $5.6 million will be announced at a later date. Mucho Macho Man heads to the breeding shed after a stellar career, having won or placed 20 times in 25 starts, coast to coast. Campaigned for most of his career by Dean and Patti Reeves and trained by Kathy Ritvo, Mucho Macho Man served early notice of his talent, with runner-up efforts in the Nashua S. (G2) and Remsen S. (G2) as a two-year-old, despite being a June 15 foal. On the Triple Crown trail, he won the Risen Star S. (G2) and ran a gallant third in the Kentucky Derby (G1) behind champion Animal Kingdom. Following the Classics, Mucho Macho Man won or placed in all 12 of his subsequent starts on fast dirt tracks, including nine G1 or G2 races. His seven wins during that stretch included open length victories in the Gulfstream Park H. (G2), Suburban H. (G2), and Awesome Again S. (G1), culminating in his tenacious win in the 2013 Breeders’ Cup Classic (G1). This year, he opened the season with a dominant 14-length win in the Sunshine Millions Classic at Gulfstream, his second victory in that event. 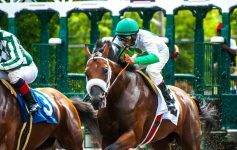 Mucho Macho Man will stand alongside his sire, Breeders’ Cup Juvenile (G2) winner and champion Macho Uno, and four other Breeders’ Cup Classic winners: Alphabet Soup, Awesome Again, Fort Larned, and Ghostzapper. For additional information contact Eric Hamelback at (859) 987-1798. — at Adena Springs. Next Article Jose Santos: Hall of Fame Jockey. Jeff Carle’s First Guest in the Gallery.